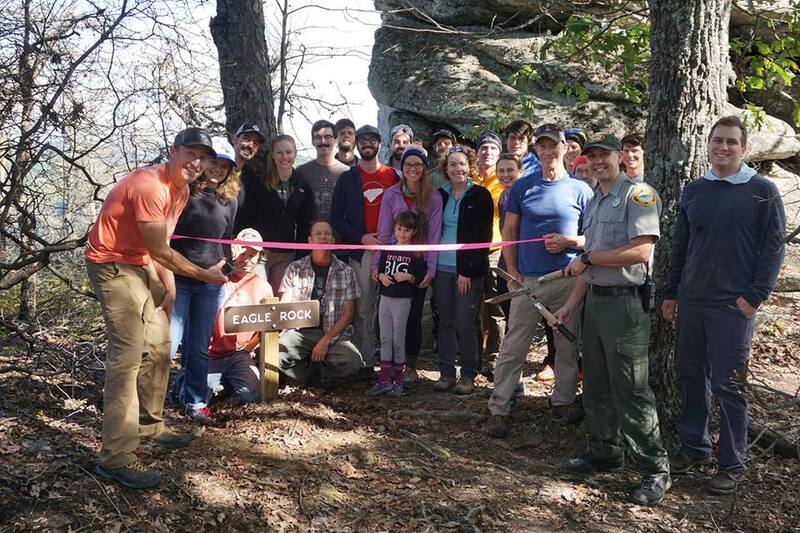 Chimney Rock State Park is proud to announce that the new Eagle Rock Access is officially open! In partnership with Carolina Climbers Coalition, Friends of Chimney Rock State Park, and Conserving Carolina, the last finishing touches were made on this climbing area that was first developed for climbing in the 1980’s. Due to difficulties with public access and management, this area has not been open to climbing until now! Last May, Conserving Carolina finished building the 10 mile Weedpatch Mountain Trial that connects The Town of Lake Lure’s Buffalo Creek Park to Chimney Rock State Park’s Eagle Rock. This trail was designed for hiking and mountain biking. The trail’s terminus is the upper tier of Eagle Rock. A spur trail named the Tunnel Trail leads climbers and hikers to the lower tier of climbing. Visitors no longer have to walk the 10 miles to rock climb. Instead, climbers only have to hike about a mile to the state's newest climbing area. On Saturday, October 13, 2018, Carolina Climbers Coalition, Friends of Chimney Rock State Park and Chimney Rock State Park staff came together to install wayfinding signs, clean-up trash and erase years of graffiti. A ribbon-cutting ceremony with a toast capped off the work and then the real fun started--climbing! There are more than thirty climbing routes accessible within between a five twenty-five minute hike from the parking area. There are also area boulders that have potential to be developed. This trail offers great views for hikers and mountain bikers. (Note: mountain bikes are not permitted on the Tunnel Trail.) The Eagle Rock Access is part of the wider Hickory Nut Gorge State Trail system still under development. Visit https://trails.nc.gov/state-trails/hickory-nut-gorge-state-trail for more information. Due to the limited parking area, visitors will have to sign up for a parking spot via the park's website. Go to https://www.ncparks.gov/chimney-rock-state-park and click on the "Parking @Eagle Rock" link on the left side of the webpage to sign up for a free parkig space at your specified date and times. Be sure to read the instructions carefully. Chimney Rock State Park is proud to be in partnership with so many great organizations to make western North Carolina a top destination for recreation!